JUN 1958 - JUN 1958 Newport R I Official Visit of Secretary of the Navy. Wilkinson (DD-930) was laid down on 1 February 1950 at Quincy Mass. by the Bethlehem Steel Co. Shipbuilding Division reclassified a destroyer leader DL-5 on 9 February 1951; launched on 23 April 1952 sponsored by Lady Catherine Moore the former Mrs. Theodore S. Wilkinson and commissioned on 3 August 1954 Comdr. Donald G. Dockum in command. After shakedown training out of Guantanamo Bay Cuba and the usual post-shakedown availability Wilkinson departed her home port Newport R.I. on 21 February 1955-with Rear Admiral Arleigh Burke Commander Destroyer Force Atlantic Fleet (and s oon to become the Chief of Naval Operations) and members of his staff embarked-and carried Admiral Burke on an inspection tour that included visits to San Juan Puerto Rico St. Thomas Virgin Islands Guantanamo Bay and Havana Cuba; and Key West Fla. U pon her return the destroyer leader became flagship for Commander Destroyer Flotilla (DesFlot) 2 part of the Atlantic Fleet's antisubmarine forces. For three months thereafter the ship conducted antisubmarine warfare (ASW) exercises. On 11 July Wilkinson-with 70 1st and 3d class NROTC midshipmen embarked-departed the east coast for a training cruise. During the ensuing voyage the warship touched at Edinburgh Seotland; Copenhagen Denmark and Guantanamo Bay before returning to the United States on 2 September. Wilkinson departed her home port on 24 October 1955 for air defense exercises in the Gulf of Mexico with Commander DesFlot 6 embarked. During that cruise Wilkinson visited New Orleans and Havana before she arrived back at Newport on 18 N ovember. On 2 December the ship entered the Boston Naval Shipyard for a five-month overhaul and the installation of improved 3-inch antiaircraft guns. After successfully completing her sea trials for her newly installed 3-inch 70-caliber battery Wilkinson conducted underway training out of Guantanamo Bay. She later visited Port-au-Prince Haiti; Charleston S.C. and Norfolk Va. before taking part in large-scale ASW maneuvers in June. The ship's performance during the fiscal year 1956 earned her the Battle Efficiency "E."
In July 1956 Wilkinson departed Newport bound for San Diego Calif. and duty with the Pacific Fleet. En route to her new home port the frigate visited Havana; Balboa Canal Zone; and Buena Ventura Colombia before she became flagship of Comman der Destroyer Squadron (DesRon) 17-the first ship of her type assigned to the Pacific Fleet. Between August 1956 and March 1957 Wilkinson operated locally out of San Diego and took part in ASW air defense and amphibious exercises. One highlight of that period occurred on 14 September 1956 when Wilkinson headed a veritable "armad a" of 70 fighting ships during a 1st Fleet review off Long Beach in what some called the largest naval parade on the west coast in 22 years. During March and April 1957 Wilkinson operated in the Bering Sea and the Aleutians visiting Kodiak and Dutch Harbor Alaska en route to her operating area. While steaming back to San Diego she touched at Esquimalt British Columbia; Seattle Wa sh. ; and San Francisco. Later during part of May Rear Admiral Chester Wood Commander Cruiser-Destroyer Force Pacific Fleet embarked in Wilkinson for air defense and ASW exercises. In June the warship visited Portland Oreg. to take part in t he annual Rose Festival activities. In January 1959 Wilkinson deployed on her first Western Pacific (WestPac) cruise visiting Pearl Harbor Hawaii; Subic Bay Philippines Buckner Bay Okinawa; Kaohsiung Taiwan and the Japanese ports of Yokosuka and Kure before she returned to L ong Beach in March embarking Commander DesRon 19 upon arrival. After again operating locally between April and October 1959 she participated in various exercises off the coast of California and in another 1st Fleet review. Wilkinson began her second WestPac deployment when she departed Long Beach in October. Coming under the operational control of Commander 7th Fleet Wilkinson took part in the Taiwan Strait patrol ASW tactics and various fast carrier task force operations in the Far East. Returning to Long Beach in March 1960 Wilkinson entered the naval shipyard there for a five-month overhaul. During that period of repairs and alterations the ship's combat intelligence center ( CIC ) was enlarged and modified and a long-range ai r search radar was added. In addition a DASH (Destroyer Anti-Submarine Helicopter-sometimes sardonically nicknamed the "Down At Sea Helicopter") system-was installed. This change increased Wilkinson's ASW capacity several fold. Following Wilkinson's departure from the shipyard in August 1960 she carried out six weeks of underway training out of San Diego. She operated locally during October and November and after a month-long leave and upkeep period in December was dep loyed to WestPac for the third time departing Long Beach on 3 January 1961. En route to the Far East Wilkinson-a unit of Destroyer Division 191-visited Pearl Harbor; Midway; and Apra Harbor Guam. In mid-March 1961 she headed for the South China Sea where an increased American naval presence was required by the Laotian c risis. After operating with a fast carrier task group almost continuously well into the spring the destroyer leader departed WestPac on 12 May and reached Long Beach on the 27th. She entered the Long Beach Naval Shipyard in June for the installation of improved sonar equipment a task that continued into mid-1962. After refresher training the warship operated in Puget Sound for technical evaluation of her new sonar system and the n returned south down the coast to work with submarines in the southern California operating area. Following further local operations Wilkinson departed Long Beach on 17 June 1963 to return to the Atlantic Fleet. Calling at the Mexican ports of Acapulco and Salina Cruz en route Wilkinson transited the Panama Canal on 29 June and arrived at Newport on 5 July. Within two weeks Wilkinson was underway for sonar evaluation that continued until 8 December. During the operation the ship visited Bermuda and New York City. The frigate subsequently made another operational evaluation of the sonar system from 1 July 1964 to 20 May 1965 at which time she reported to Commander Cruiser-Destroyer Force Atlantic Fleet. During that time the ship operated in the Gulf of Mexico and the Caribbean and along the continental shelf between Newport and New York. During th e cruise the ship visited Key West Fla. and conducted type training in the Jacksonville Fla. operating area while steaming back to Newport. After a pre-overhaul tender availability Wilkinson visited New York City for four days off-loaded ammunition subsequently at Earle N.J. and proceeded to Boston for an overhaul which lasted until 5 February 1966. After returning via Earle to Newport a little over a month later Wilkinson sailed south to Cuban waters for refresher training-conducting those evolutions between 11 March and 28 April. While still at Guantanamo on 8 April the ship received orde rs at 0310 to assist a burning freighter. Underway at 0407 Wilkinson sped at flank speed to the scene of the disaster and at 0720 reached the stricken Norwegian passenger freighter Viking Princess. A fire and rescue party from USCGC Co ok Inlet (W-384) had meanwhile boarded the blazing merchantman to fight her fires. 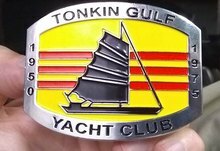 At 0809 Wilkinson began closing the Nationalist Chinese merchantman Chungking Victory to receive the surviving crew members of Viking Princess-a p rocess completed by 0914. The frigate took the 13 survivors back to Guantanamo where she arrived shortly before noon and disembarked the rescued mariners. After departing Guantanamo Bay on 28 April Wilkinson touched at San Juan Puerto Rico and reached Newport on 2 May. She remained in port until departing on the last day of the month bound for Boston and an availability. During the ensuing overha ul the ship received a number of repairs and alterations including the final installation of new sonar equipment then being evaluated by the Navy. Briefly departing Boston on 15 August and again on 30 August the frigate conducted sea trials and tested her sonar-during cruises lasting but a day or two-before she completed her availability and sailed for Newport on 31 August reaching her home port the following day. For the remainder of 1966 Wilkinson remained in port at Newport except for three periods of independent steaming exercises (ISE's)-from 6 to 9 September from 23 to 26 September and from 2 to 5 December. Underway on 15 January 1967 Wilkinson headed south to Argentine waters subsequently taking part in the Argentinian naval review at Mar del Plata from 4 to 8 February on the occasion of the celebrations commemorating the sesquicentennial of Argentina's independence. Returning to Newport on 5 March Wilkinson then proceeded to the Bethlehem Steel Shipyard at East Boston Mass. where she received a data acquisition system for her sonar equipment. She returned-via Stamford Conn. where she participated in Veter an's Day memorial services-to Newport on 4 May. Later that month Wilkinson sailed for Montreal Canada where she served as part of the United States exhibit during "United States Week " from 21 to 28 May at the world's fair Expo 67. Highlighting Wilkinson's stay at Montreal was a surpr ise visit to the exposition by President Lyndon B. Johnson. During the ceremonies at the United States exhibit Wilkinson men served as Presidential Honor Guard. Returning to Newport on 1 June Wilkinson continued further sonar evaluations into the summer and fall months of 1967 operating primarily out of Newport but also east of the Bahamas. Between her periods at sea were times in port for tender availab ilities and type training in the Narragansett Bay operating area. The ship put into Port Everglades to take on fuel on 3 October and was standing back out on the 5th when a weak cleat snapped while the motor whaleboat was being secured for sea. The whiplash of the line struck a sailor injuring both of his legs and requ iring immediate medical attention beyond that which the ship could provide. Wilkinson immediately headed back to Port Everglades at flank speed radioing ahead for a boat to pick up the injured seaman. A torpedo retriever boat sent out by the Naval Ordnance Laboratory and Test Facility took the man on board to a waiting ambulance at pierside. The seaman was then taken to Homestead Air Force Base hospital where he was treated for fractures of both legs. After the incident Wilkinson returned to sea and conducted further sonar tests-in company with Grouper (AGSS-214)-before the frigate visited Freeport Grand Bahama from 11 to 13 October. Proceeding back to Newport soon thereafter Wilki nson reached her home port on the 25th but soon headed south for repairs at the Norfolk Naval Shipyard. She returned to her home port on 21 December. Beginning 1968 in-port at Newport Wilkinson spent much of the rest of the year conducting further technical evaluation of sonar equipment in the Bahamas interspersed with type training in the Mayport operating area and in-port periods at Newport. After a preoverhaul period of availability alongside Yosemite (AD-19) Wilkinson entered the Boston Naval Shipyard on 13 September for her regular overhaul that rounded out the year and lasted into June 1969. Following her sea trials Wilkinson got underway for Narragansett Bay for sonar tests before she set course for Earle N.J. to load ammunition in preparation for refresher training. Late in July the frigate visited New York City from 25 to 28 Ju ly before she shifted to Newport on the latter date. She remained in her home port for almost a month conducting a dependents' cruise in Narragansett Bay operating areas on the 22d. It was during that cruise that the ship's commanding officer announced t hat Wilkinson was to be decommissioned as part of a cut back in military expenses. With the cancellation of all her previous schedules Wilkinson shifted to the South Annex of the Boston Naval Shipyard to commence inactivation on 3 September. 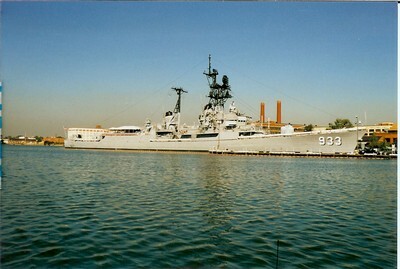 Shifting to the Naval Inactive Ship Facility at Philadelphia on the 22nd Wilkinson was decommissioned on 19 December 1969 and placed in reserve. Struck from the Navy list on 1 May 1974 Wilkinson was sold to Luria Brothers. She departed Philadelphia under tow on 19 June 1975 to be scrapped.